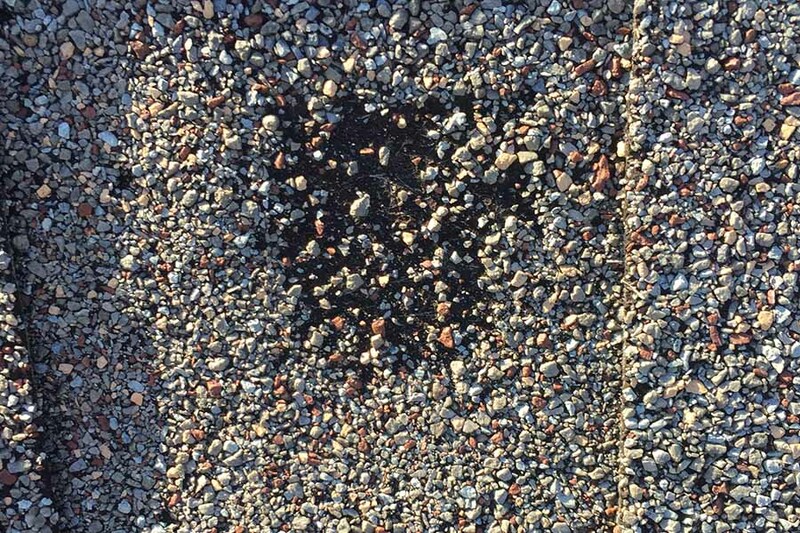 Roof hail damage can be hard to spot. Especially if you’ve never looked for it before. But if your roof has been damaged by hail, your home may be vulnerable to roof leaks or more rapid deterioration of shingles or roofing materials. …to equip you with some tricks of the trade to inspect your property and get an idea of whether or not you may have hail damage on your roof. PLEASE NOTE – Inspecting a roof can be dangerous. Always practice safety first. We do not advise you to get on your roof unless you have proper safety gear and relevant roofing or construction experience. If you need professional help to determine whether you have hail damaged on your roof, contact a reputable, local roofing company for a full hail damage roof inspection. First, let’s check out some pictures of actual roof hail damage… so you get an idea of what it looks like. What exactly does hail damage on a roof look like? Now, here are a few things to get you started to see if you may have hail damage on your roof. Look for dents and dings on gutters and downspouts. If a hailstorm has struck your area, hail stone impacts will often show up in small dents and dimples in metal gutters and downspouts. A dented or cracked mailbox may indicate a recent hail storm came through the area. Look for cracks or holes in plastic mailboxes or dents in metal mailboxes. 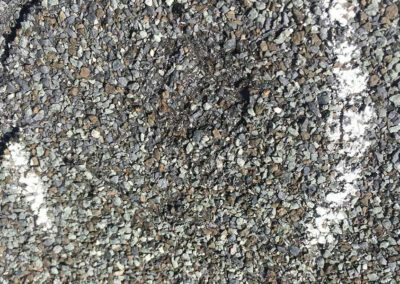 Hailstone impacts may remove dirt, grime, algae from driveway surfaces, indicating size and direction of hail fall. 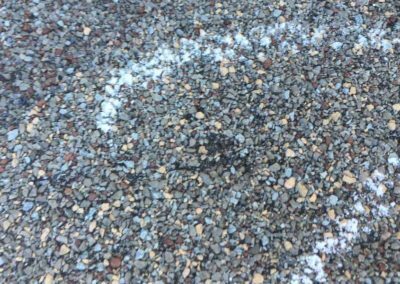 Look for splatter marks on your driveway that are lighter than surrounding areas on driveways or sidewalks. Check your home’s siding for splatter marks, dents, cracks, paint chips or holes. In heavy hail storms, this damage will be obvious. But smaller hailstones can also cause damage that may point to hail damage on your roof. PRO TIP: Soak aluminum siding with water from a hose before photographing to make damage more apparent. Check windowsills and casing for small cracks, dents and dings. Check caulking for tears or signs of impact. Also check window glass for small cracks. 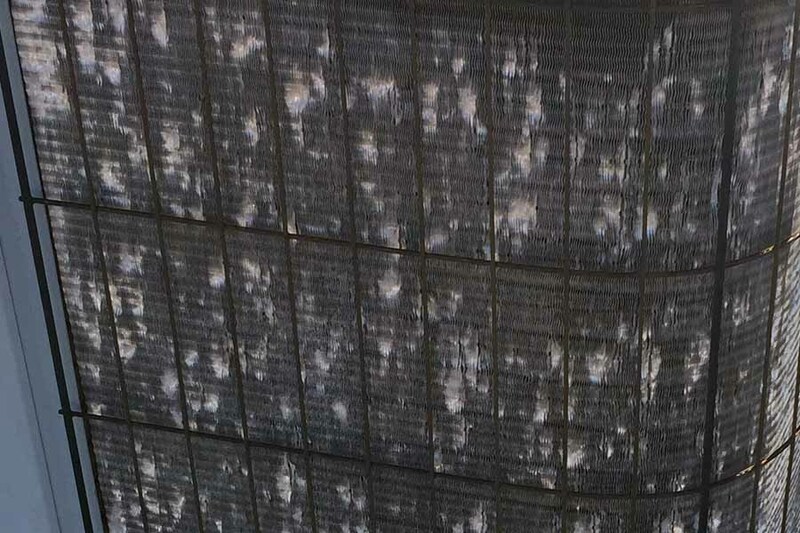 Hail sometimes causes tears or holes in metal and fiberglass window screen mesh. Look for any impact marks, cracked or broken glass on doors and windows. Inspect metal doors for dings or dents, or look for chipped paint or stain on wood doors. Look for hail damaged flower beds, bushes whose leaves have been stripped or beaten down by a heavy hail storm. 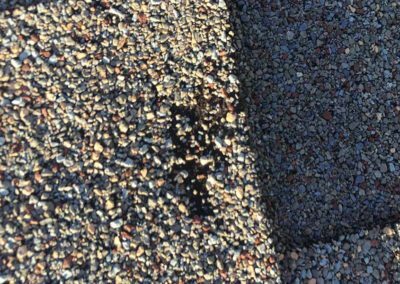 May indicate shingle damage that holds and harbors moisture. Also indicates older shingles that may have sustained hail damage from older storms. If cars in your neighborhood sustained hail damage, it’s likely that neighborhood roofs have been damaged as well. If you see roofing contractors working on other homes in your neighborhood after a hail storm, other homes were likely damaged in the storm. Get your roof inspected. Large hailstones often have a rough and jagged surface and generally fall at higher speeds the larger they get, amplifying their capacity to do property damage. Look for broken bits or loose shingles that may have fallen off around the house and in the yard. Hail is usually accompanied by high winds. If you see shingles in the yard, you may have wind or hail damage on the roof. Take a look at your outdoor furniture. Hail will crack or put holes in plastic yard furniture. It may also chip the paint or splinter the wood on wooden furniture. Look for cracked or broken light fixtures in the yard or on the sides of house. Check garage doors for dents, dings, paint chips, scuff patterns. Check play sets and swing sets for dents, dings, paint chips, scuff patterns. Look for splintered wood or light discolored spots in the stain. Check sheds or buildings for damage to metal roofing, siding, etc. Look closely at the roof of metal utility sheds for dents. Look at shingled utility sheds for small spots where shingles are dimpled or have missing granules. 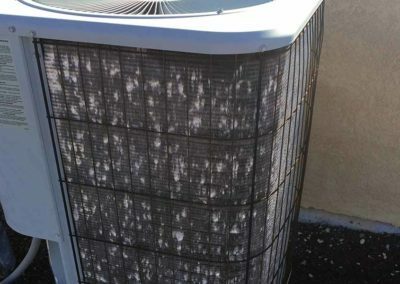 Check the air conditioner condenser unit housing for dents or damage from hail. 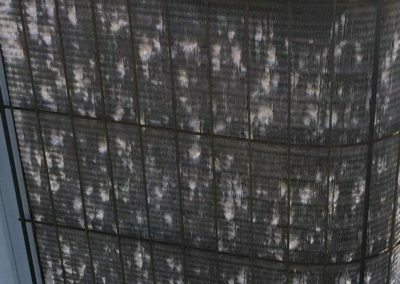 Check the condenser coil fins for dent. Cracks and holes in window well covers may indicate diameter and quantity of hail. 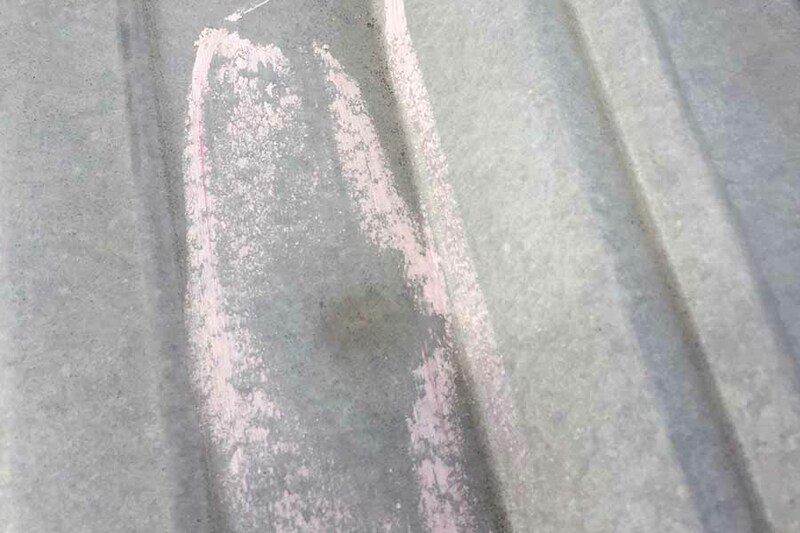 Dents in the soft metal of various wall vents may point to potential roof damage. On wood fencing, look for fresh wood scrapes from hail impact, dents, or splintered wood. Look for holes or cracks in vinyl fencing. Large hail stones may cause visible damage to your deck. Check deck stain/paint for cracks, splits, chips and indentations. Check any painted wood surfaces around the house for dimples or paint chips. Look for freshly exposed wood. Look under eaves or porches for signs of water leaking through roof to external wood surfaces. This may point to old hail damage that leaks through shingles. Splatter marks or dents on exterior metal electrical panels or other metal surfaces may indicate the direction and size of hail stones. If there’s a pool, check for any debris from storm damage. Hail storms may cause extensive damage to trees, stripping leaves that end up on the ground. Check the yard for any large broken/fallen tree limbs. Heavy wind storms that bring down large limbs or branches are sometimes accompanied by large hail stones. Cracks in piping and other pool equipment may indicate major roof damage. Watch this video to learn about the violent updraft speeds required to make big hail. Look for tears or deformation in metal or plastic leaf guards and screens on gutters. 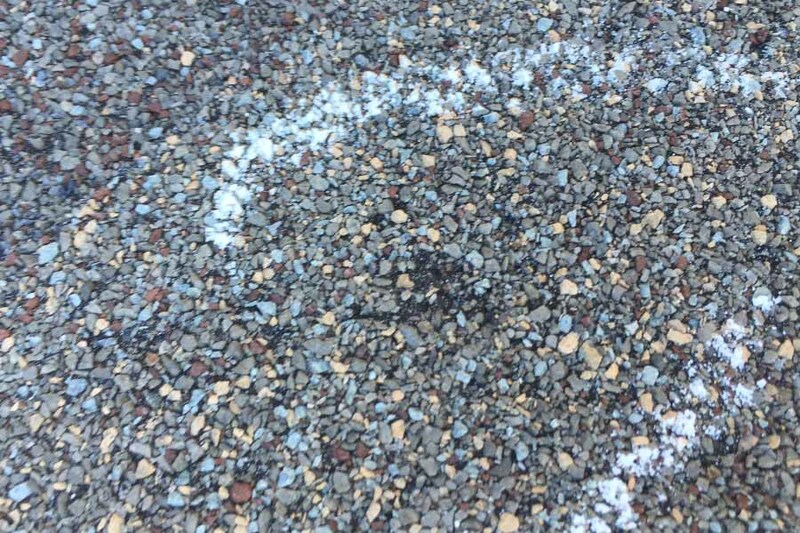 Hail damage on your roof will cause granules to break loose at the site of each hail stone impact. 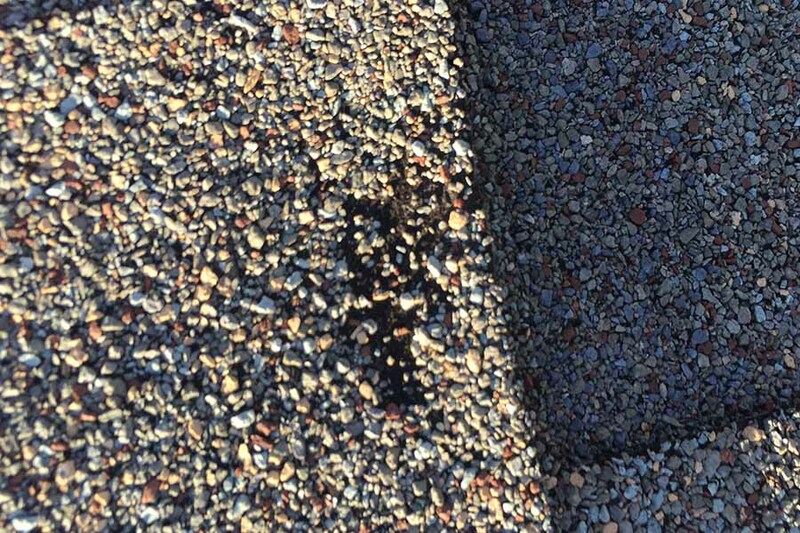 If you notice shingle granules in your gutters, you may have hail damage on your roof. Roof vents are often made of lightweight metal. 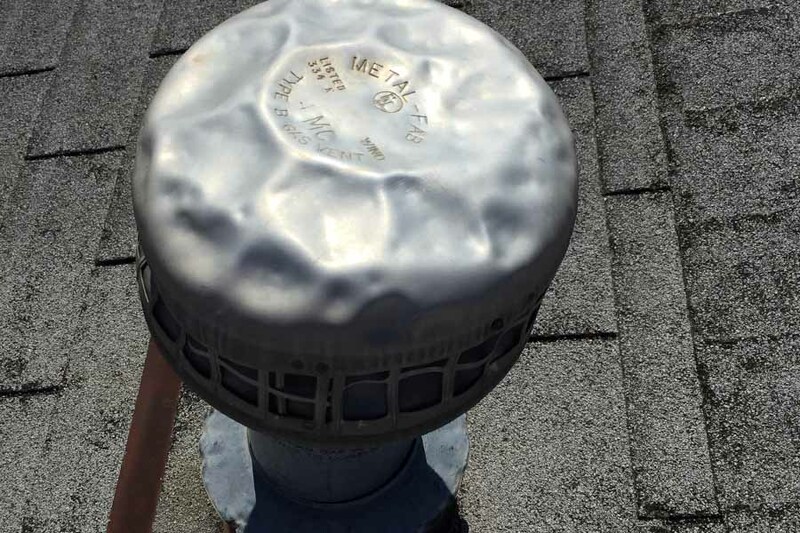 Dents in the metal or cracks in plastic vents often means your roof was hit with heavy hail. Inspect metal flashing around chimney or vents & fascia for dents or dings. These are relatively easy to spot. Look for chipped paint, spatter marks or damaged satellite dish components. Check for cracked or broken glass if your roof has skylights. Look for dents and dings on metal chimney covers. Be careful, these are difficult to access. PRO TIP: Turn your chalk sideways and rub on metal surfaces to reveal any hard-to-see dents/dings. Check the roof for any missing shingles or shingle tabs that may have blown off. Look for any shingles that are easily pulled up or flapping from the wind from storm damage. Hail hits on shingles may show subtle spots of granule displacement, bruises in shingle surface, or holes. 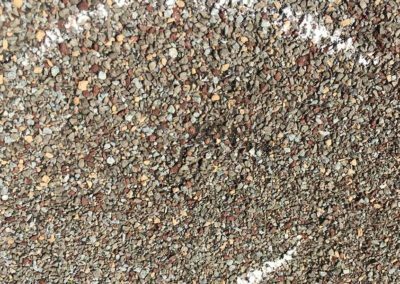 If you see any dark spots on uniform shingle surfaces or dimpled areas, you most likely have hail damage. 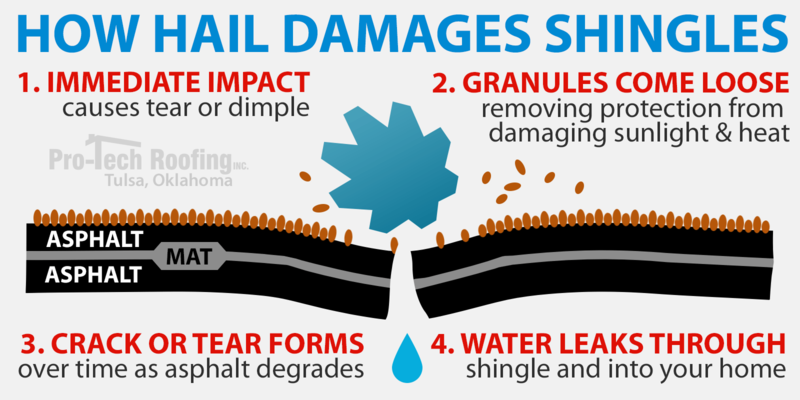 Hail damaged shingles may experience curling or stress cracks over time. They age faster than non-damaged shingles. Even old hail damage may be covered by insurance. Contact a professional roofing company for a roof inspection. 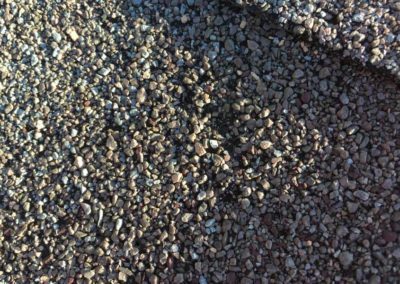 PRO TIP: Hail damage on the roof is specified as a loss in water shedding capability, or the reduction of the long term service life of the shingle. Check metal roofs for any dents and dings. Color with chalk laid against the surface to find subtle dings. Hail damaged wood shingles may be completely split or cracked or have indentations that affect the long-term integrity of the shingle. 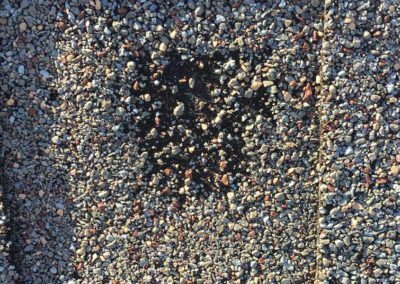 Look for punctures or cracks in soft roofing materials, like PVC or weathered roof patch compounds. Clay and slate tiles may be cracked and broken from large hail hits. If you’ve noticed any slow or recurring water leaks inside your home, you may have hail damage on your roof. Look for any water stains on the ceilings (corners especially) for signs of roof leakage. Look for bubbling paint, where water gets trapped between drywall and paint during a storm. Check out all indoor light fixtures, can lights as these are often more prone to show water leakage. Look in closets and other hard to reach areas for water stains on ceilings or walls. If you notice mold or mildew on any interior wall or ceiling, you may have a leaking roof. If you have access, check the attic rafters for water stains and/or wet insulation that point to roof leaks during heavy rain. Check the garage ceilings and corners for any water stains, discolored walls, etc. …including roof type, roofing material quality, installation methods, shingle layers, roof slope, wind speeds, etc. However, there are some guidelines. 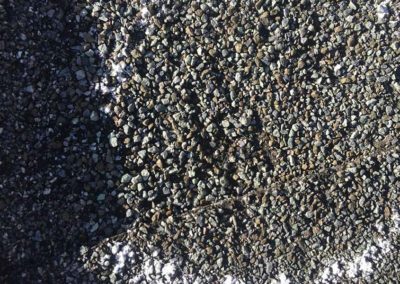 If your roof contains one layer of common asphalt shingles, it usually takes a 1″ or above diameter hail stone to cause damage roof hail damage. Roofs with multiple shingle layers may be damaged by smaller hail stones, due to a softer support surface directly under the top shingle layer. 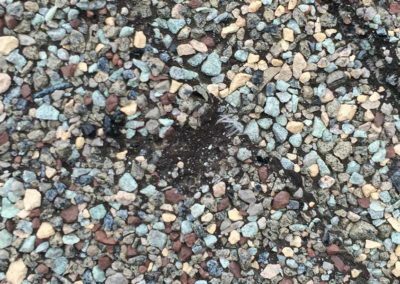 Not surprisingly, some roofing materials are more hail-resistant – multiple field surveys and studies have been done to look at the damage potential of different size hail stones on various types of common roofing materials. Ice stone impact tests combined with field observations provide some common correlation between hail stone size and roof damage potential. 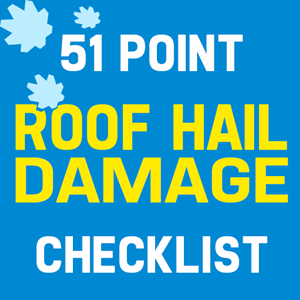 We hope this guide helps you as you look for the possibility that you may have roof hail damage. We advise you to take pictures and document your losses for your own records and for insurance. Do not call your insurance company and file a claim yet. Contact a professional, local roofing company and ask for a hail damage roof inspection. Your roofer can provide a detailed inspection to help you determine whether your roof has enough damage to warrant a claim. In addition to diagnosing the problem, a qualified roofer will be able to offer an affordable and long-lasting solution to make sure your home is safe and dry for years to come. In or around Tulsa, Oklahoma? Call the professionals at Pro-tech Roofing – (918) 250-7663.